That this whole thing wasn't over in Europe? And that energy prices were going to drag the world down again (although less than in the last rise)? It sucketh with a mighty sucking sound, but we are racking up slow, grinding YoY real increases. More on January later. Retail Europe (pdf from Eurostat): YoY December -1.6% Euro area, -1.0% in EU27. On a month over month basis, November retail sales dropped 0.5%, and December retail sales held at that level. Industrial Production US: In December, industrial production was down 2.0% since December 08. On the month, it was up 0.6%, same as November. Industrial Production Europe (pdf from Eurostat): December 09 compared to December 08 industrial production fell 5.0% for the Euro area, and fell 4.9% for the EU27. For December compared to November, industrial production fell 1.7% in the Euro area, and 1.9% in the EU 27. 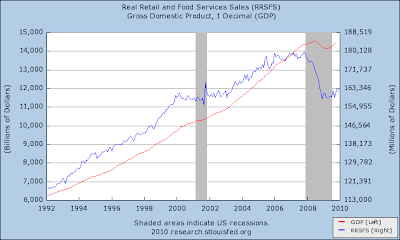 GDP US: Heh, remember the 5.7. Still, this is somewhat temporary, although given recent sales data we should have enough to get us through a few months. GDP increased by 0.1% in both the euro area1 (EA16) and the EU271 during the fourth quarter of 2009, compared with the previous quarter, according to flash estimates published by Eurostat, the statistical office of the European Union. In the third quarter of 2009, growth rates were +0.4% and +0.3% respectively. Compared with the same quarter of the previous year, seasonally adjusted GDP decreased by 2.1% in the euro area and by 2.3% in the EU27 in the fourth quarter of 2009, after -4.0% and -4.3% respectively in the previous quarter. During the fourth quarter of 2009, US GDP increased by 1.4% compared with the previous quarter, after +0.6% in the third quarter. US GDP rose by 0.1% compared with the same quarter of the previous year (-2.6% in the previous quarter). If Germany had done better in Q4 Euro numbers would look better; Germany's GDP increased 0.7% in Q3, but did not increase in Q4. Bundesbank numbers. So part of the issue with the debt in Greece and Portugal, Ireland, etc is the combination of slow growth with high debt writeoffs in certain commercial and mortgage categories, combined with a rather difficult prospect of containing the debt. Greece is just out of bounds, and would have to launch an austerity program to contain their debt. But if they do, that austerity will not help the rest of the region rebound, and the same goes for other somewhat debt-loaded members. And then there's another reality - it is probably in Germany's interest to have a cheaper Euro to help some industry segments. As for energy prices, they have been somewhat schizophrenic. Energy prices high enough to reduce world growth rates have their own natural bounds. The theory that we will have acute energy shortages rests on a continued rise in consumption which seems to be somewhat contradicted by recent events. You have any idea on whether we are making any progress in increasing our production of "stuff" for which there is an authenic market? By that I mean things and services which can and will be puchased independently of governmentally funded debt? As opposed to housing, etc. Glad to hear you made it through the storm all right. Any idea what's up with China? A lot of folks seem to think the end of their bubble is nigh, but I'm not entirely sure. An economy based on government-directed lending is a bubble almost by definition, but I can't think of any way of knowing at what point they just can't go on anymore. Neil - the property bubble is going to be tailing down, because they are doing things that should impede lending somewhat. The question is how much private money is going into it? The nasty part of bubbles is that they pull money from all sorts of other places, so it is very hard to get them to subside rather than pop. Archon - we do make a lot of stuff and we do export it, but an awful lot of what we make is more on the heavy equipment/infrastructure side. Also we export substantial amounts of food. Spending is picking up on food and clothing. But infrastructure is low and probably won't be good for several years, so that part is impaired. As the government stimulus fades from the picture this year, the infrastructure prospects tend to wilt as well. That is probably some of the German problem - they make a lot of capital goods.